It was 1990, in just four short years I had gone from cobbling together $75 from friends and a relative to start a small electrical contracting business, to a burgeoning multimillion dollar, national business with almost 500 employees. I had learnt the art of raising money from banks, and had now secured an investment from The International Finance Corporation, an arm of the World Bank. I had been named both Business Man of the Year and Industrialist of the Year. I was now sole owner of the business, as my partner had cashed out, and gone to establish his own business, before the IFC investment. We remain good friends to this day. I began to think for the first time that I could tackle work in neighbouring countries, I chose Mozambique. So one morning, as part of my research into the opportunities in the country I visited their local embassy and spent several constructive hours with officials. When I left the Mozambique Embassy Building, I decided to walk back to my office rather than be driven. As I walked, I noticed a vehicle that appeared to be driving slowly behind me, but being deep in thought, I paid it no real attention. When I finally got into my office, two men rushed behind me, and abducted me at gun point! I was taken to a secret detention centre by my abductors. Time and choice (today) constraints stop me from going into must detail about this incident. But let me say what is important; as I was in the place where I was being held and my abductors were outside, I did something I had not done since I was a child, I got on my knees and prayed earnestly to God, with tears in my eyes begging him to rescue me… He heard me! …. I was rescued from my ordeal that night!…. 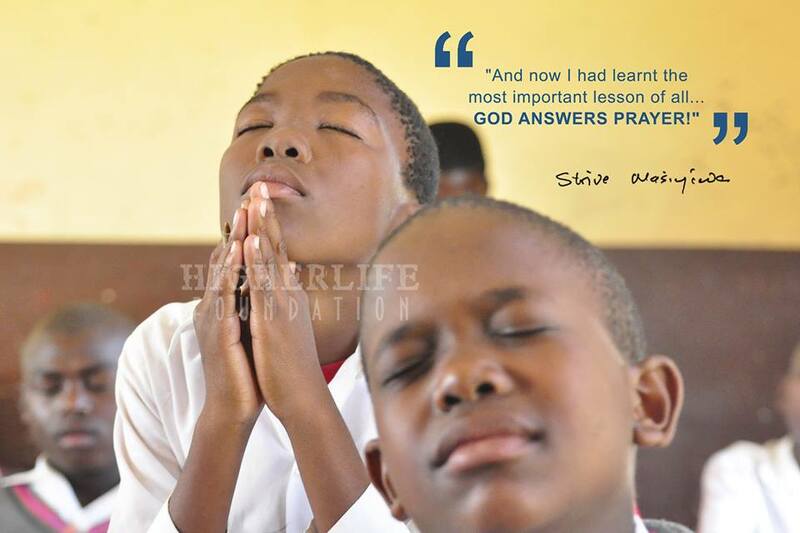 And now I had learnt the most important lesson of all… GOD ANSWERS PRAYER! I came remarkably close to losing my life. We shall return to this issue again, my relationship with Jesus Christ, that is…..
Dzidefo Agbo, Asks: Mr. Strive Masiyiwa, i watched an interview of Alhaji Dangote and he said he worked 16 hours daily. You have also stated that you sleep for only 6hours. I know you are a committed christian and a vital partner with the ministry. I also know that you are the head of the businesses you own, you have people handling the business, why don’t you only monitor and give direction to them but always up. Mr Dangote, and I are very good friends. We are currently working together on a program for the United Nations Sec General, headed by former British Prime Minister Hon Gordon Brown. Our mission is to try and get the 57m children worldwide, who are not in school, to get an education. As you are probably aware I run a multi billion dollar business organization, with operations and investments on 4 continents, in 17 countries. To be able to do this, I rely on a highly experienced management team, who are one of the best, in the world. I do not have to even visit, most of the countries. I will be sharing with you, over the next few months, how one runs such large organisations. I am also involved in many humanitarian initiatives, which take up 50%, of my time. This is my choice, since I turned 50 years, old. I sleep for only 6 hours, a day, as a lifestyle, and not because I have too much work, to get through. I have never known a successful leader, in any sphere of life, whether it be business, politics, or ministry, or military, who spends long hours sleeping! It is absolutely not necessary to sleep for more than 6 hours, unless you are ill. When I wake up every morning, I am refreshed: I pray and study the bible for two hours, then I go to the gym, and out I go, excited to take on a new day…glory to God!!! Bill Gates, became the richest man in the world, selling computer software, does that mean we should all head into computer software? Sam Walton, built the world’s largest company, WalMart, which is a global supermarket chain? Should we all go into supermarkets? Alico Dangote, is the richest man in Africa, and he sells cement, does that mean, the money is in cement? Mark Zukerberger is making billions with Facebook, so has the money now moved to the Internet? No, of course not! What about oil, and diamonds? Is that where the big money is? Of course not! There are many that have made fortunes there, but even more, lost everything, and even their lives there! I could go, on and on… It is not about what industry you are in. Every industry offers EXACTLY the same opportunities, for you to achieve greatness. Look to understand the principle, rather than to get a “formula”. When I was studying engineering at university, I discovered that it was not possible to cram so many formulas, it was always much easier to focus on understanding the principle from which the formula was created. So it is with some of the things, I am trying to convey to you, in these posts: I want to teach you principles, rather than to give you formulas. Look for the principle, and not the formula. For instance I showed you the principle by which I got to learn about organizations like IFC, 25 years ago. If you use the same principles, you will quickly get to learn about the organizations that are available, today, but if you now ask me to send you a list, then you are looking for a formula. It means I must stop everything that I am doing and spend weeks drawing up a list to send to you, of all the organizations that are there today. I personally have no need for such organizations any more, because I have moved on. A principle requires deeper thought, and understanding of an issue, than a formula. I urge you to look for the principles, rather than formulas. Next Post Every game has its rules, and also a language!